Every homeowner needs to own a Generac gas pressure washer. Why? Each Generac pressure washer is powered by a Generac OHV engine that has a low-oil shutdown feature to protect the engine and extend its life. Generac pressure washers are all designed with easy-access pumps to prevent you from having to kneel on the ground to make hose connections. From cleaning your car to blasting away the dirt of a commercial building, Generac has a pressure washer solution to meet your needs. 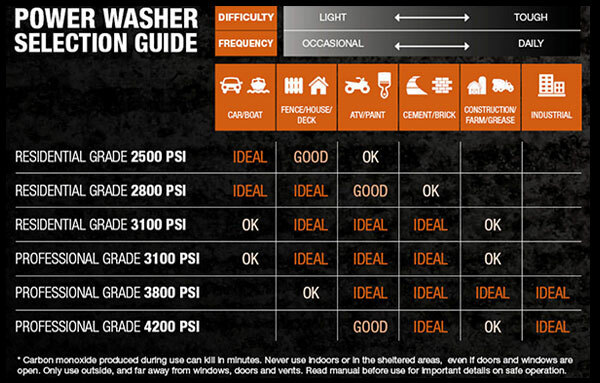 Use the diagram below to find out which Generac power washer best fits your needs.